La Paz, Sept. 10, 2008 The violence experienced on September 9 in the city of Santa Cruz has forced organizers to suspend, for security issues, the events planned in this city to launch the IX International Festival of Indigenous Peoples Film and Video. 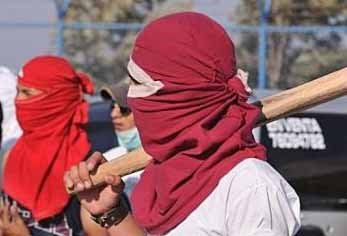 Following occupations by "civic" groups of the opposition of different public institutions and communication media centers related to the government, fearing potential attacks to participants of the festival. These have (been the) reasons (which) forced the indigenous organizations to suspend the Festival in Santa Cruz. Racist thugs roam the streets of Santa Cruz. Since 1985, the Coordinator of Latin American Cinema and Communication Indigenous Peoples, CLACPI, alongside indigenous organizations and allies of different countries, promotes the development of International Film and Video Festivals of Indigenous Peoples. In this edition, violence and intolerance have silenced the message of Indigenous and originating in many parts of the world. After the triumph of violence and unreason, the festival has little choice but to now move on to the city of La Paz, where the film "The Cry of the Jungle", the first indigenous feature film produced in Bolivia, was planned to start next Sunday September 14. This film narrates the struggle of indigenous peoples defending their territory in the Bolivian Amazon in the face of subjugation suffered at the hands of large landowners. These landowners and other opposition groups are precisely those who now seek to halt the process of empowerment of indigenous peoples living in our country. However, hardline opposition violence will not prevent the Ninth International Festival of Film and Video of Indigenous Peoples from: asserting full social, political and cultural recognition of indigenous peoples; highlighting the value of images and communication that uphold a pluralistic world in which Indigenous peoples can build the future we seek; motivate the production of film and video works that give voice to indigenous peoples and that portray indigenous peoples with dignity; strengthening the ties that bind and Native and non-indigenous people from different continents fighting for a more just world and for the full recognition of self-determination rights. Organizing Committee, IX International Festival of Indigenous Peoples´ Film and Video. www.clacpi.org Comment from Wilna Quarmyne, host of the Our Media meeting in Ghana this year: "A strong reminder, as Jethro says, of the importance of OURMedia in creating - and maintaining - supportive spaces. Heartbreaking for the organizers to suspend the opening, but they did well to choose to protect Festival participants - and to continue to move on. "